You are a clean and organized person? Come and help us keeping the Hostel beautiful! Come and be part of our team as a worldpacker, enjoy all the benefits of our hostel. You will meet people from all over the world and have a cool place to stay while doing a good job in our laundry keeping everything clean and organized. It's just a few hours of help per week, and a lot of fun in Santiago! Tarefas Domésticas: Ajude a trocar roupas de camas e a manter um ambiente arrumado. Ajuda na Limpeza: Ajude a limpar cozinhas, quartos, banheiros e outros espaços. Descontos em tours: Ganhe descontos em tours ou passeios pela cidade. Passeios de graça: Te levamos para fazer tours e passeios pela cidade. De graça! Festas de graça: Ganhe entrada gratuita para as melhores festas da cidade. The work includes 5 shifts of 4 hours a week,with 2 free days. The activities are brooming and waxing the floors ,cleaning the rooms,kitchens and backyard each day in the morning. There is 5 shifts of 4 hours from Monday to Friday,the weekends are off days for the cleaning volunteers!. 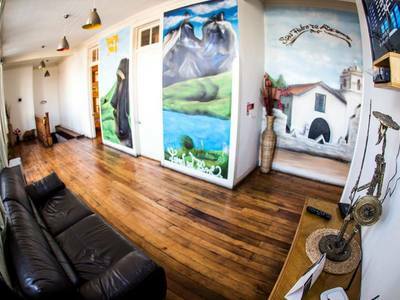 We only ask for the volunteer to be organized with the work and give attention to detail when cleaning since we all want the Hostel to be a nice place to stay!.